When this card is Normal Summoned, you can Special Summon 1 Level 4 or lower “Six Samurai” monster from your hand. 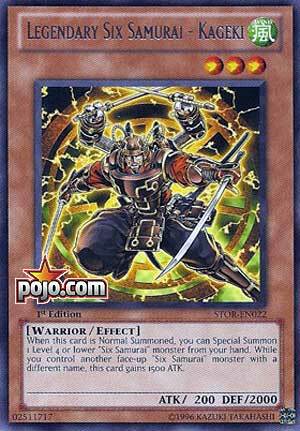 While you control another face-up “Six Samurai” monster with a different name, this card gains 1500 ATK. The first Throwback Thursday of 2018, and we will look at a card that is 7 years old, which is hard to believe for me. From the second wave of Six Samurai monsters in Storm of Ragnarok, apart of the Legendary Six Samurai theme, we have Kaigeki. Kaigeki is a Level 3 Wind Warrior with 200 ATK and 2000 DEF. Terrible ATK for a Level 3, but great DEF. Level 3 Warrior and being a Six Samurai gives you Smoke Signal and ROTA. Wind again has few real benefits. When Kaigeki is Normal Summoned, you can summon a Level 4 or lower Six Samurai from the hand. Kagamusha is a popular choice to use with Kaigeki to go into Shi En, but using your one Extra Monster Zone for Shi En isn’t enough, you need to Link Summon first to be honest. You can also summon something like Enishi, Hatsume, Kizaru, or maybe even Fuma, all of which are some of the more popular Six Samurais. If you have another Six Sam with Kaigeki, then Kaigeki gains 1500 ATK to make up for the pathetic 200 ATK. The card is a great play extender for the deck, no reason to run less than three.